Even though an AVI container sounds a bit outdated but it’s still very popular due to the higher quality of playback as well as viewing on larger screens. If you want to transfer an AVI video file to your mobile phone or tablet for playback, you'd better have it compressed beforehand. Otherwise, you might end up with a very slow rendering speed or playback issues. Being one of the traditional containers, it’s not surprising at all to find that most players support the playback of an AVI video file. This includes the Windows Media Player, Real Player, VLC and much more. However, it’s still very dependent on the actual video and audio codec which could affect its compatibility. If you are looking for different method on converting your AVI videos, you can perhaps try out the different methods detailed below. Converting your AVI video files online is more straightforward and less tedious. There’s no installation required but the supported output format can be quite limited even for best online and free AVI converters. The speed of conversion also varies according to your internet connection. Generally, there're 3 options to upload your video files. This is offered by most online converters, you just simply locate where you have saved your AVI videos in your PC or laptop. If you have stored them externally in a hard drive, just plug-in the USB cable and then upload it from there. Directly copy and paste the video’s URL for conversion. This saves a lot of time if you tend to download your AVI videos from online streaming sites like YouTube, Yahoo, Vimeo, Hulu, etc. Note that this option depends on the online converter, it might not be available for all. 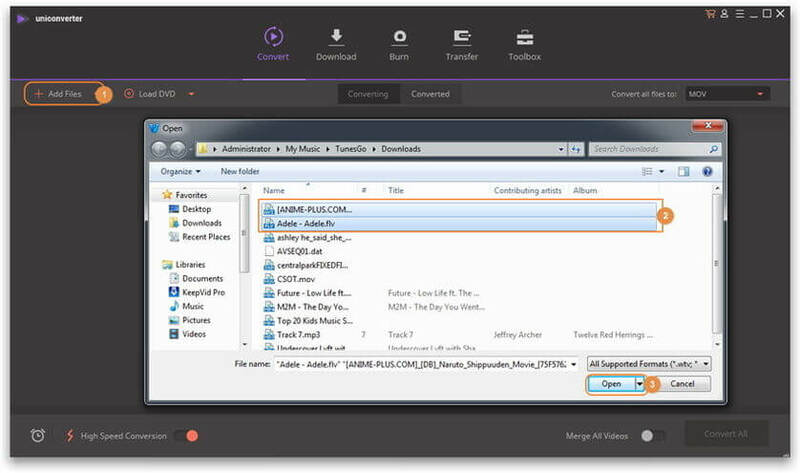 Instead of having to browse through your local folders, simply drag-and-drop your video files. This options also might not available to all online converters. If the online converter fails to or doesn’t support the output file type that you’re looking for, you’ll probably need a desktop converter, the Wondershare UniConverter (originally Wondershare Video Converter Ultimate). Don’t let the required software download or installation stop you because you’ll be getting a whole lot more in return for that few minutes wait. 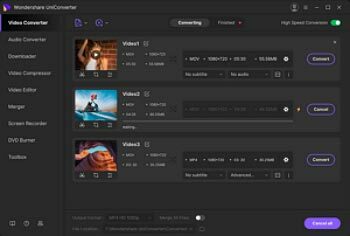 Similar to the online AVI converter (in Method 1), you can also upload your video files onto the program either by browsing the local folders, copy and pasting the URL or a quick drag-and-drop. The major difference between both converters is that all of three options are made available in the Wondershare UniConverter (originally Wondershare Video Converter Ultimate). Step 1 Add your desired video files to the program by simply drag-and-drop way, upload from your local folders or copy and paste the video’s URL. Note: If you wish to perform some editing on your videos before the conversion, click on the editing icons under the video thumbnail. 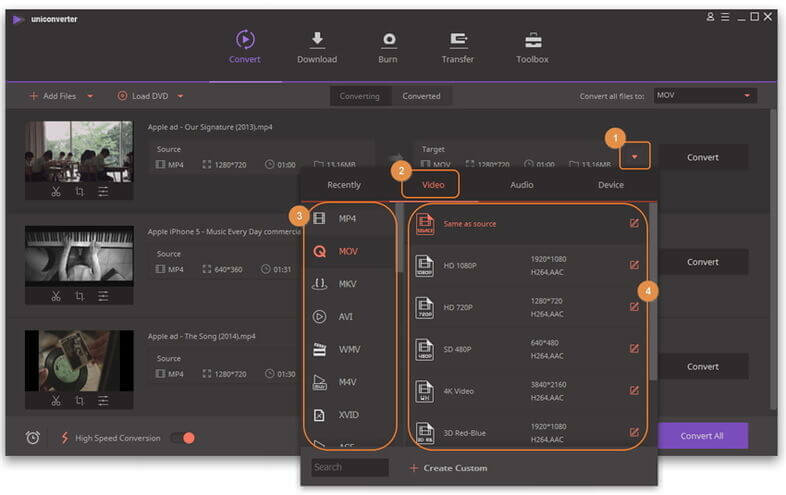 Step 2 Click the icon in the Target section to get a drop-down list, where offers a huge variety of supported output formats neatly categorized into Recently, Video, Audio and Devie. you can select either based on the brand or model of your portable devices or specific file type. Step 3 Click Convert to start conversion, and you'll find the converted video files within minutes.